ASPCA Gives PGC a Big Boost! Thank you to the ASPCA for renewing your support of Pretty Good Cat for the 4th year in a row. The funds are being used to provide emergency medical care for cats and kittens who are in critical situations, homeless and with no other means of support. Thanks to you we will be hard at work providing service through our Vets, partners, and volunteers. Our services are provided in partnership with other ASPCA efforts, such as spay and neutering at the South LA Free Spay and Neuter Clinic, which has fixed literally thousands of cats and dogs in an underserved area of Los Angeles. Thank you for your continued, faithful support of our kitties and thank you for your generous grant of $10,000. We greatly appreciate all you do for us and animals all across the country! Pretty Good Cat is so grateful for this new ASPCA grant award. We are so pleased that you have given us this opportunity. In the past, with your support enabled us to reach serve over 1,500 kitties. Some were spayed or nurtured, some received new homes and some were given much needed emergency medical care. We thank you for the trust you have extended to us and for this support. This grant will enable us to continue to address an major gap in animal services in Los Angeles: emergency medical care for a minimum of 40 unsponsored cats in critical situations. In partnership with Drs. Henry Yoo and Raja Boctor, and the ASPCA LA County network of veterinarians, when an unsponsored critter needs help we are able to assist. By subsidizing medical care and good Samaritans who intervene in these emergency events and with the great discounts committed by our veterinarian partners, we will be able to save the lives of a significant number of felines. While not funded directly by the ASPCA, this grant will also enable us to continue to spay and neuter a good number of cats through the ASPCA Clinic. And, of course, we will also continue working with over 30 rescue partners that are the result of previous ASPCA awards. We would also like to thank Jill Buckley for her wisdom, compassion and support. She is a wonderful ambassador for the ASPCA. And Kathy Taggares - who is changing the world! We’ve said it before but these two women keep making magic. Thank you again for your trust, your support and for all of the other initiatives that you are conducting. The miracles continue. CITY NATIONAL BANK : NEWEST PRETTY GOOD CAT SPONSOR! Pretty Good Cat is so thrilled to announce that CITY NATIONAL BANK awarded Pretty Good Cat $500. On behalf of all the little animals who will receive care and loving homes because of this gift, we thank you. Since 2008 our group of committed volunteers has worked tirelessly to rescue, foster, and place cats, kittens and other animals throughout Southern California and to mitigate the overpopulation of feral cats and homeless dogs. As our services have grown, the need to reach more little animals has grown as well. That is why we formed Pretty Good Cat, a nonprofit 501(c)3 in June of 2011. Last year 189 kitties were adopted, over 650 cats were spayed/neutered and 96 unsponsored cats received lifesaving medical care. City National Bank has made it possible for us to do even more. And not only have they given us this grant, one of their wonderful staff , Maria, just adopted two rescue kitties and she is a great mom! If you are in need of any banking services, go visit Sonia and Maria at City National Bank at Second and PCH in Long Beach. They are wonderful to humans and cats. Check out Yin and Yang. We rescued these little fuzzy beans at just two days old from under a pallet at a construction yard. Even though Jennifer Mitchell already had two beautiful kittens she was fostering, she stepped up and offered to take these babies. This is what rescuing is all about. A group of amazing people that love these critters to no end. I am very grateful to have such an amazing team! Thank you all! Nya was rescued from an alley in Indio, CA.She was living under a house with an old eye injury. Thanks to a generous supporter and the doctors at Desert Dunes Animal Hospital, Nya is now on the road to recovery. Nya is very sweet, affectionate and loves being around other cats. She will be ready to join a loving home soon. My latest adoption, which took place in April last year, is a 17-year-old cat. He has one crossed eye, two ears that are positioned close together on the middle of his head and stand straight up, and a snout. He sits like a grasshopper and yowls during the day and sometimes at three in the morning. He also bears a strong resemblance to actor Ian McKellan. And I loved him madly the minute he set his four paws in my house. His original name was something like Kitty, but when Judy Taylor from Pretty Good Cat brought him to me, I took one look at him and said, “Your name is Old Scratch.” It goes. I first saw his photo in an e-mail sent by Denise Reesha, a local Realtor who uses her contacts to home unfortunate cats and dogs. 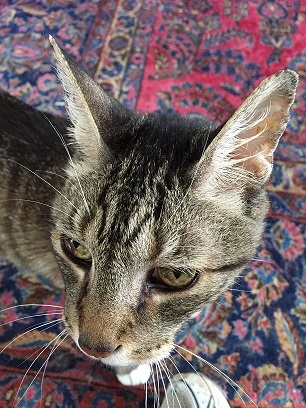 I had lost my 16-year-old, Woodbine, to a heart attack the previous month; he was the cat of my own heart and I was very, very sad. When I saw Old Scratch’s photo and read his story, I thought, this is horrible, kicked out of what looked like his forever home. His own teenage human, who’d had him since he was a kitten, brought him with great sadness to Judy. It broke her heart to give him up, but she knew that that was the best way to love him. I thought, hmmm. I posted him on Facebook. I got a lot of Likes and several aww, how sads. I thought about him for the rest of the day. I thought about him before I went to bed. I was thinking about him when I got up. I turned on the computer, took down the post, and told Denise to let the rescuer know that I’d take him. “Oh!” read the delighted e-mail. “You’ll love him! He’s very spry for his age!” To me, that meant that he was able to walk to his food dish, take a couple of bites, wash his nethers, and go to sleep for the next 12 hours. Boy, was I wrong. Judy brought him in, and he immediately started purring and butting me with his head. “Would you like something to eat?” I asked. He seemed to think that that would be lovely, so I fixed him a plate. He ate with the appetite of a human teenager, making breathy purring noises as he did. Judy and I smiled at each other with delight. After lunch, he discovered a couple of cat toys in the room I’d set aside for him and started rolling around the futon playing with them. I have two other cats who get along with each other and had loved Woodbine, so I figured that a week in the room to start would be good. When the week was up, I cracked the door open. Miss Brooks, the one-and-a-half-year-old (she’s two now), came sidling up to him, her head and back alternating in two opposite directions. Old Scratch padded up to her, said, “Charmed,” and went in search of the food dish. Mildred, the 13-year-old housewife, hissed once or twice and that was it. It didn’t take long for Old Scratch and Miss Brooks to chase each other around the house, nails scratching on the Pergo. Every now and then, Mildred takes a play-nip at his hind legs. Spry is an understatement. Scratchie, as my friend Bryan calls him, is loved by all of us. He enthusiastically introduces himself to everyone who enters the house. He has a couple of issues—thyroid and kidney—so he takes meds and eats a special diet. A week ago at this writing, Judy came by to see how he was doing, and she was pleased. I of course was pleased that she was pleased! “You certainly landed in the butter dish,” she told Scratchie. She’d brought some little play mice for the cats and a coffee cup for me. “I wanted to give you something,” she said. “You already did, a few months ago,” I replied. I don’t know how much time that Scratchie will have with us, but we’re all making sure that it will be quality time no matter what the quantity. And if Old Scratch is an example of a pretty good cat, I imagine that the excellent ones are pretty darn impressive. To many humans, socializing is a part of life. If you are a human, what do you usually do with your friends to socialize? Sure, kittens can't get coffee or drinks. They can "get food!" Usually, young kittens do not have much difficulty socializing, but older kittens (with little positive human contact) can be a lot harder to socialize. Not all cats are created equal, but these techniques can help your feline friend. Growing kittens already have a big appetite, so work off of that fact. Possibly, make kittens interact with you to get their reward (their food). Pull their food dish as close to you as possible, and stay with the kittens until they are finished eating. When they are finished, pull the dish away with you. Remember, always leave water out for them. After that, create body contact with them while they eat. Possibly, it would be good to pet them gently around their head and shoulders while they snack. You can also place a dish of food in your lap and let the litter to climb in to get it. After a short time, you will be able to pick them up. Usually, picking them up low to the ground and moving them between dishes will not impact them when they are hungry. Although, all cats are different. Do what you feel is comfortable for you both. When Cats Say "I Love You"
As our cats become a part of our families, they also become a part of our hearts. We can tell them all the time that we love them, but they can’t exactly say it back. We can show them love with belly rubs, treats, and warm laps to sleep on, but how do they show us their love? Although our feline friends can’t say “I love you,” they can tell you in other ways. Some mistake these things as cats playing around, but cats want to share their love too! Look for these signs to see how much your cat loves you and your family! It turns out…cats are actually great gift givers. Although you may not want a dead animal in your home, cats believe they are showing their love to you. Also, offering their toys to their owners can be seen as a present from them. This may not be a friendly gesture from a human, but cast might be leaving traces of their scent to claim you as being a part of their family. Don’t get mad, nipping is another form of showing their love. They are trying to show affection…not harm! If your cat is kneading you like a pizza, it’s to show their love. This is a form of affection that they learned while nursing with their moms. Sure, cats purr when they are happy! If your cat(s) purrs around you often, it’s purr love! So, you’re going to adopt a pet! We would like to congratulate you on your decision to take in one of the millions of animals that are living in shelters right now. A pet can be a gift to a home and a family, but a pet is a large responsibility. When taking in a pet, there are ten main things to remember. 1. You and your family have to take a large commitment to take care of your pet for the rest of its life. 2. Be sure that your neighborhood and home is 100% pet friendly. Look into the pet policy that your landlord or homeowner association may have. 3. Make sure to make time for your pets. Bond with your animals and make them feel comfortable in their new environment. 4. Create a safe home for your family member. Pets can be curious, so keep your new shoes and medications out of reach from animals. 5. Research about your pet, and find out about foods and plants that are dangerous to them. 6. Create a safe home by ensuring that pets cannot fall into trashcans or get caught in cabinets. Also, discuss dangers with visitors to ensure the pet’s safety. 7. If you are sharing the responsibilities of your pet with others, make sure to communicate about feedings and/or walks. 8. Set aside a budget for your pet’s expenses. This can include vet care, food, medications, and grooming supplies. 9. Make sure to have your local pet hospital and/or ASPCA Animal Poison Control Center on speed dial in case of emergencies. 10. Take lots of pictures of your pet’s growth. You’ll enjoy them for year to come. This baby kitten just found her new home! Stephanie is the proud mother of her new baby kitten! We are in kitten season already this year and there are so many cats that need good homes! Please keep Pretty Good Cat in mind if you are thinking of adding a new family member to your home!